In order to see the fine details in dense tissue, breast tomosynthesis and mammography images should exceed 5 million pixels. 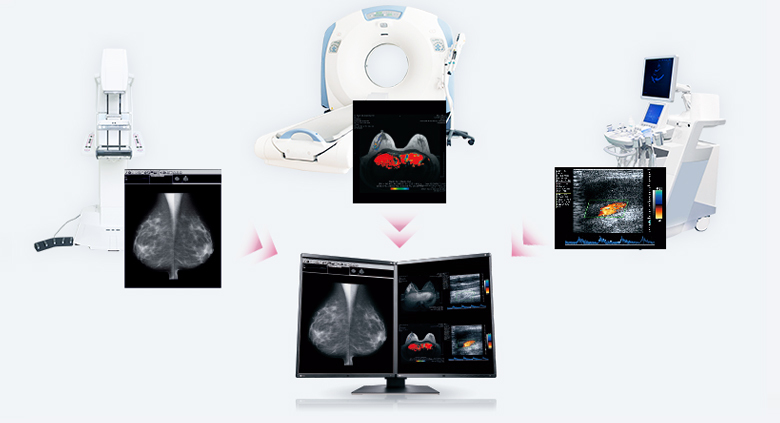 The 5 megapixel RadiForce GX550 and RadiForce RX560's high resolution ensures that details are preserved when viewing high volume breast images. In order to achieve a more accurate diagnosis in breast cancer, a combination of mammography and ultrasound screenings are carried out. If a cancer cannot be easily detected, more precise methods such as MRI may be used. 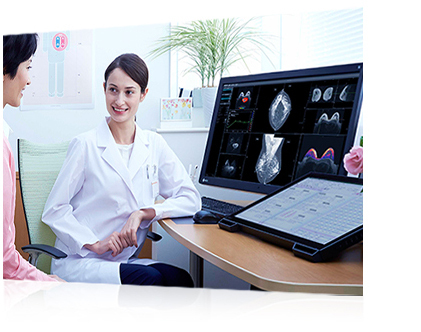 To accurately display and compare this variety of color and monochrome images, EIZO offers the RadiForce RX560 MammoDuo color monitor with dual-screen configuration. 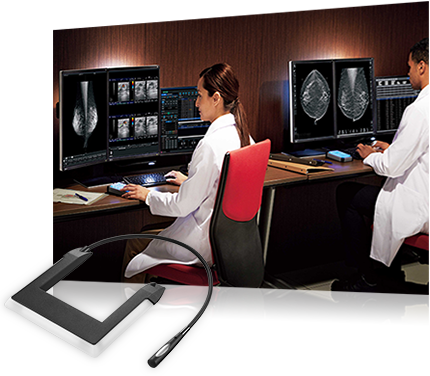 With RadiForce RX850's multi-modality support, you can increase work efficiency with the ability to view numerous medical images on one screen in exceptional accuracy. 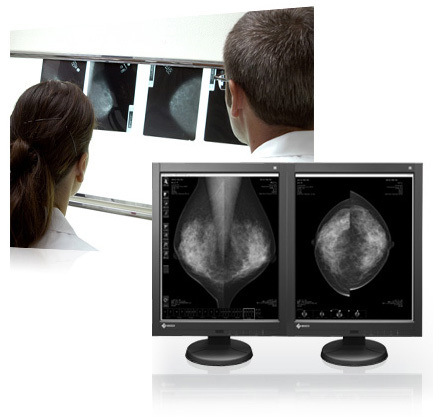 A research study conducted by the University of Arizona demonstrated reader efficiency of the 8 megapixel RadiForce RX850 compared to dual 5 megapixel monitors when viewing mammography images. The study showed that on average the radiologists saved 10% of the time spent viewing and scanning the images on a single 8 megapixel screen compared to the dual 5 megapixel monitors, improving the workflow. In addition, the Radiforce RX850 had the same diagnostic accuracy as the 5 megapixel monitors. In a separate study, 77% of radiologists surveyed agreed or strongly agreed that using the EIZO RX850 workstation for both color and monochrome images in a multi-modality environment would improve how efficiently they work. Due to digitization and improved efficiency of medical imaging devices (modalities), radiologists have experienced an overall increase in the demand for medical image reading. 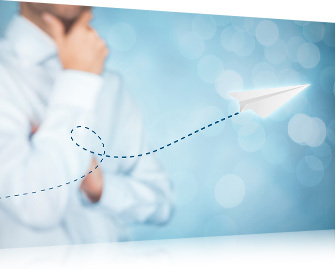 EIZO developed its unique Work-and-Flow function to ease the workload with a solution that addresses workflow efficiency. To alleviate the burden of increasing workloads on radiologists, the Point-and-Focus function which was newly added to Work-and-Flow, makes it easier to concentrate on interpretation and diagnosis by allowing the user to focus on specific regions of the screen. According to the "European guidelines for quality assurance in breast cancer screening and diagnoses," the mammography diagnoses reading room must have an illuminance of 20 lux or less. RadiLight illuminates the wall behind the monitor, providing lighting in accordance with these guidelines and also ensures that there is no reflection on the screen to interfere with your work.